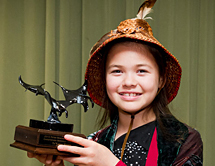 Ta'Kaiya is a ten-year-old first-nations Canadian activist and singer fighting a proposed tar sands oil pipeline and tanker terminal planned for British Columbia's coastal waters. When she learned oil kills sea otters, her favorite animals, she became an activist with Greenpeace and others. Her beautifully sung protest song, "Shallow Waters" is a Youtube sensation. Her new song, introduced at an Occupy Vancouver rally, is "Earth Revolution".